The Language of the Lens explores the expressive power of the camera lens and the storytelling contributions that this critical tool can make to a film project. 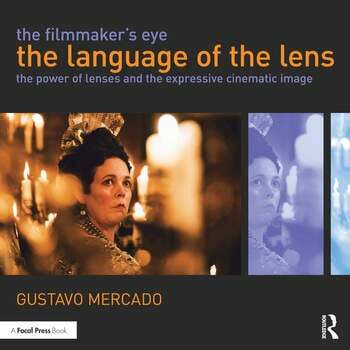 This book offers a unique approach to learning how lenses can produce aesthetically and narratively compelling images in movies, through a close examination of the various ways lens techniques control the look of space, movement, focus, flares, distortion, and the "optical personality" of your story’s visual landscape. Loaded with vivid examples from commercial, independent, and world cinema, The Language of the Lens presents dozens of insightful case studies examining their conceptual, narrative, and technical approaches to reveal how master filmmakers have harnessed the power of lenses to express the entire range of emotions, themes, tone, atmosphere, subtexts, moods, and abstract concepts. The Language of the Lens provides filmmakers, at any level or experience, with a wealth of knowledge to unleash the full expressive power of any lens at their disposal, whether they are shooting with state-of-the-art cinema lenses or a smartphone, and everything in between. Gustavo Mercado is an award-winning independent filmmaker with well over a decade of experience as a writer, director, and cinematographer of narrative films. His first book in the Filmmaker’s Eye series, "The Filmmaker’s Eye: Learning and Breaking the Rules of Cinematic Composition", has been translated into French, Spanish, Chinese, Polish, Turkish, Portuguese, Japanese, and Korean, and is used by film programs at colleges and universities worldwide. He teaches cinematography, editing, screenwriting, and film production at Hunter College’s Film & Media Studies Department in New York City. "The Language of the Lens combines beautiful visual examples from a wide range of films to explain the aesthetic and emotional connotations of lens language. Understanding the technical and creative aspects of the lens is essential for cinematographers and directors to punctuate the thematic essence of the scene. A very useful visual reference, this book is a must read for any aspiring filmmaker."